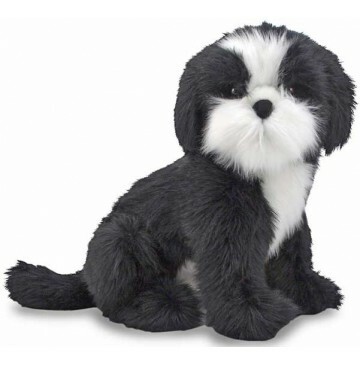 So sweet and adorable, this furry Shih Tzu is made by Melissa and Doug. Looking for a new BFF this lifelike dog is made with excellent quality and attention to construction in the design process. Plus, with its realistic details including the floppy ears and stubby tail this puppy wants to take up residency on your lap! Bring home a friend to adore, or make an impressive statement in your bedroom. These soft, cuddly, premium quality plush animals have beautiful features. Cute expressions and are incredibly priced. The soft, lovable textures and remarkable prices make these animals friends perfect for play or display. Makes a wonderful accent for your child's room plus it's perfect for use in daycares, pre-schools, schools and doctor's offices.